One of the highlights of the academic year is taking place this weekend at Fletcher. 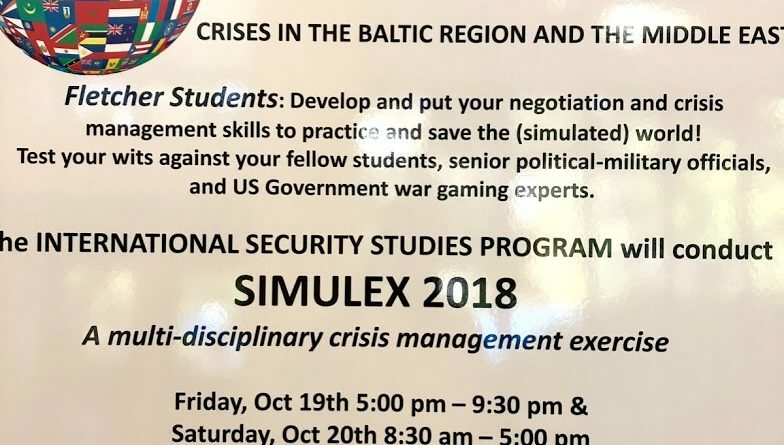 SIMULEX, the annual crisis management exercise hosted by the International Security Studies Program (ISSP), will take over the building on Friday and Saturday. 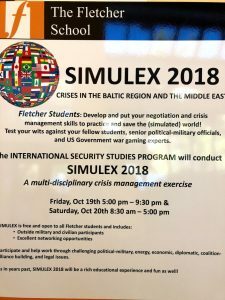 While my mental image of SIMULEX sometimes resembles a game of Nukem!, or involves tense standoffs and commands of “turn your key, sir,” in reality it’s a major learning and professional networking opportunity for the Fletcher community, and not limited only to students formally focusing on security studies. Participating students will assume roles of key international actors, alongside visiting representatives from the Department of Defense, CIA, National Security Council, and wargaming experts from branches of the armed forces, among others; the weekend typically sees around 200 total participants. Recent past scenarios have centered on crises of succession in Saudi Arabia, inflamed tensions between Taiwan and mainland China, and the humanitarian emergencies in Syria. Part of the fun of SIMULEX is working under pressure with limited and rapidly changing information, so details provided ahead of time are mostly limited to a background briefing provided to participants in advance of the event. Thus far, we know that this year’s scenario will focus on a crisis involving the Baltic Region and the Middle East. Fletcher students often cite this opportunity to work alongside practitioners with experience in similar real-world crises as particularly formative, and the expectation here is that this year’s SIMULEX will prove as popular as ever.